Tiles are a great flooring choice for busy families because they look great and they are usually easy to clean. Sometimes, though, you might notice that your tiles have become very difficult to clean. They appear to be dirty again very soon after you’ve washed the floor. While this can happen anywhere in the house, you may notice it more in your bathroom and in front of your kitchen sink. Soap scum makes your floor tiles dirty. Just as it does on your shower tiles, soap build up on your floor tiles and effectively traps dirt under the layers of soap. Not only is it ugly, your floors are actually dangerous because they become increasingly slippery over time. Instinct tells you your floor tiles need a really good clean and so off you go to find your mop and bucket or your scrubbing brush. But before you start cleaning, let’s stop and think about what it is you’re about to do. You have a bucket filled with soapy water and you’re going to apply it over the top of the soap build up that’s already causing you problems. More soap on top of the existing soap build up. Let’s look at a different option. Non-soap cleansers for dirty floor tiles. White vinegar is a fantastic natural alternative to soap cleansers. It’s acidic enough to cut through soap build up but not strong enough to damage your tiles or grout. A regular wipe over with a solution containing equal parts white vinegar and hot water will keep the soap scum down to a minimum. Washing soda (sodium carbonate), such a Lectric Soda brand, can work well, too. Just add a cup of washing soda to a couple of litres of hot water and get started. Use gloves in case it irritates your skin. Steam cleaning is an excellent alternative to chemical cleaners. The high temperature steam will cut through soap scum without the need for harmful chemicals. This is always a great option especially if you have young children to protect. Of course, we always recommend trying your solutions in a non-obvious place so you can monitor the results with your specific tile. Your best choice is to call in the professionals to do an initial, thorough clean and invite them back each year for maintenance. 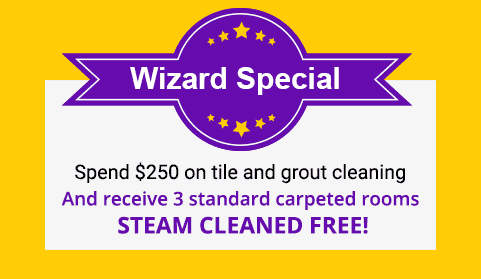 With a Wizard tile and grout clean you ensure a hygienic, clean and safe environment for your family and no more dangerous, slippery floors! We’ll also give you tips to help maintain your tiles without stress.